Over the past couple years, my whole thought process has been about making things easier for the market person in charge of managing something as complicated as a webinar. There are lots of moving parts, and dozens of small details to manage. It doesn’t matter if it’s a “big” webinar or small one – it takes times to bring it all together. And one of those details is getting the webinar on someone’s calendar. In our technology driven age, you would think that small detail has been solved, but it hasn’t. It’s gotten better, but it’s not solved. It should be as simple as sending an email. Or as simple as clicking on a single button on a webpage. Because we have very simple goal – to get OUR webinar on THEIR calendar. But that simple and easy goal is extremely difficult to achieve – in the world of technology, what seems simple, can sometimes be a monumental task. From a technology standpoint, the primary hurdle we are dealing with a delivery service (email) that doesn’t exactly know what to do with a the specific “package” being delivered (calendar invite). Although they are connected, they are actually two different types of technologies, operating under a common umbrella. Email can be seen as a generic text message (albeit a highly evolved text message), that actually has a very well defined format. On the other hand, a calendar invitation has a different defined format, which needs to be inside the email. And this format can be a bit tricky, and if it’s not “well formatted”, it will just not work. Which is why most people give up, and just send the invite as an “attachment” to the email – eliminating most of the complexity. What that does is shift the responsibility of getting the invite on a calendar to the invitee. I’ve always thought that was the wrong way to do it. I’m asking them to attend, and ultimately asking them to buy something – therefore, I should make is as easy as possible to remember to attend my webinar. The less work I ask of them, the higher probability of them attending. So, we go to work everyday on solving the easy problem. We believe it’s our responsibility to take on the hard technology challenges and make it as easy as possible to get an event (in this case a webinar) on someone’s calendar. We have worked and reworked the solution hundreds of times. We are getting closer to solving it – not just for those using software we like, but across all calendar software. We are almost there in solving the first problem – making sure we send (email) a well formatted invitation (calendar invite), that just works when it shows up. Stay tuned for more info – because in a few weeks, we will have a solution that can be put on any webpage, and just work. And we are going to make it simple to create and simple for someone to opt-in on your webpage. And when they do, they will get the calendar invite on their calendar without having to do anything else. Our beta site is called Calendarsnack is located here. So I started off my ISV journey 7 years ago. Just an innocent attempt to get people to my events by sending them a Calendar Invite. If they accepted, I knew that they were coming. Or at least had a better chance of showing up to my events. Along the way I had a Web based Calendar engine built by a local contractor on an old Cold Fusion stack. It worked and we were off on many use cases on how I thought it should work. Some 2200 hours of personal time in testing, UI design, and disastrous blunders on my part as a weekend and after work project I needed break. If this was going to be bigger idea I needed help. Enter a friend named Arnie. Arnie came into the calendar “Thunder Dome” 2.5 years ago. Or about 1800 hrs ago. It has been a part time project for him and he caught the bug as indicated that those hours are after work and weekends. He helped with so many things – testing , coding , web site, blogging and overall front end animal. I voted him to Co-Founder last year. He is a true inspiration. Then we decided to blow up the old site and start over -literally scrap all the code some – $80K in custom contract coding down the drain.. Not easy. We were both at a loss for 60 days. We knew after talking with several large test customers we needed to get to scale on AWS with SES. We then started our Pizza Journey into AWS in August 0f 2017. About 3 months ago in February of 2018 we were fortunate to recruit Jonn , who is our lead developer and CTO. We have been iterating using Slack, and brain storming on how to use SES, Python SDK, SNS, Lambda and Arnie’s Vue front end with his run time engine. We have the prototype running now in AWS. Pretty exciting to see the Pizza project running! The test site will be up and running in a few weeks. 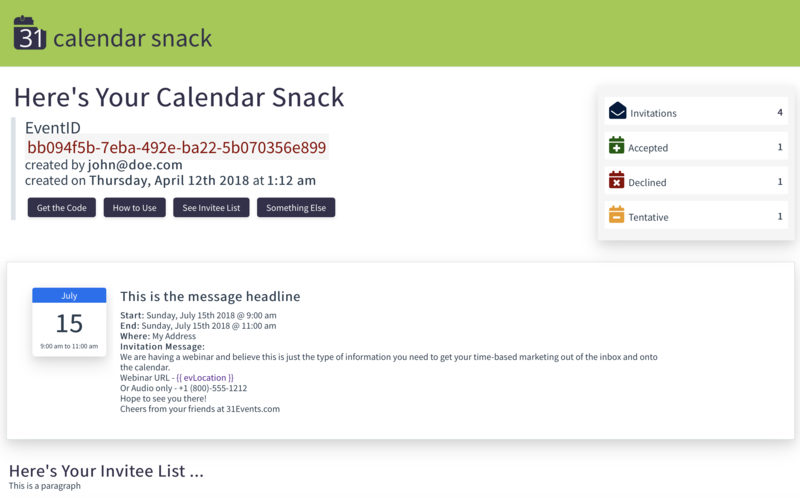 www.calendarsnack.com. More to come as we attempt to give every marketeer in the world their own calendar server for sending and tracking of Calendar invites! Yes, I know, that’s a click-bait-type headline. Nothing I can do about that, because it’s a true statement – and if you are doing any type of time-based marketing activity (and most of what we do is time based), you need to realize that simple fact. Take a simple example of an email campaign, once the email is sent, the clock is ticking – and it’s a count down clock that runs in minutes. From my experience, the first hour after sending, will provide you with about 80% of your responses (and that’s an optimistic view) and 99% of your opens/clicks will happen within 24 hours of send. Think about that, your email campaign has the lifespan equal to that of the May Fly – the real truth is, if you don’t get your numbers within the first couple hours, you won’t recover. And then there is the dismal fact of the general numbers – industry averages say only about 25% will open your email, and 2% will actually click your Call To Action. So, for every 1000 names on your email list, 250 will open, and 40 will click. Email is a tough gig, but in reality, it really is the best type of “direct contact/direct response” marketing activity. No other activity will generate the same results. You have mere seconds to get their attention and get the click. Some of this can be controlled or tested, but always make sure you keep everything within a “is it worth another hour?” parameter. If you spend 2 hours, coming up with headlines and alternate text (or design) – what’s the overall benefit? From my personal experience, it might increase incrementally, but there are so many dynamics, it’s hard to figure out which one really made the difference – because it might just be an anomaly. You’re better off spending your time on the “backside” of the click, rather than trying to get more clicks – more is not necessarily better, focus on quality, rather than quantity. Help people de-select from clicking – make it apparent what they will get once they take that next step. And the deliver on it. That’s why we’re developing 31Events – to make the click more valuable to you and to your customers. If you have a time-based activity (like a webinar or coupon), getting that info on their calendar will help your customers – and if they can get it without any effort, even better. To be completely honest, the last (almost) year has been tough. We had a working version of 31Events – that accomplished the goal of sending a very well formatted iCal/ICS file, that could be “consumed” by all the major email & calendar clients on the market. So we had a decision to make – Either make the existing platform work or to completely re-invent/code to work within an ecosystem we knew would both (1) scale and (2) be around for a very long time. So we decided to burn it down, and start over. What we’ve learned in the process of moving from a Coldfusion/MSSQL environment, is that AWS Serverless Architecture gives us both flexibility with the ability to scale – without us having to manage any servers, storage, or infrastructure. It’s been an interesting 9 months of learning for us — first, it’s a complete mindshift from our backgrounds (both Greg and I have spent our professional lives within “infrastructure” and services for large companies) in that we didn’t need to worry about the “backend”, that it would just work – regardless of what we wanted to do. Second, it forced us to really think through what 31Events does – and start breaking it down into smaller and smaller pieces, because serverless architecture is about “micro” services and functions – no longer did we need to think from an end-to-end standpoint and create functions to handle it. We now shifted to smaller functions. Third, it forced us to re-think the front-end (user interface), and what we wanted to accomplish – first as we roll out Version 1, but also what we could do as we proceeded down the enhancement and development path. I like to talk in analogies, it helps me put things into some sort of context and understand complex “things”. To wrap my mind around the direction we had planned to take, I started thinking of our new AWS Serverless backend as setting up a dominos. Our dominos can start off as a simple line … knock over the first one, and it just knocks over the next. But as we learn and grown, we can add complex patterns, or create side tracks that go simultaneously. And each “domino” is a fraction of the whole, and if it breaks, we can go back to the specific place and fix it. It really is a great way to create an application (which is what 31Events is) and have it work right from the beginning. Right now, we are still working through creating our micro services, and we’ve made some significant progress in doing that. Although the concepts are “easy” to understand, the implimentation is always going to much harder than originally thought. The other problem faced, as you march down this brave new world of serverless, is finding people who really (and I mean really) understand it – and can make it work. We’ve been through a few people along the way, but hopefully have found the right team to help us going forward. We all have “day” jobs at the moment – so 31Events is a sideline project. That doesn’t mean it’s not important (because it is, Greg and I both see examples every day where we could help people), what it means is that we can’t necessarily publish a roadmap with dates. Our first priority is to ensure we have the same functionality we had a year ago. After that, we will re-launch. Because we know, once it works, it will just work regardless of how many users we have creating and managing events & invitations. We hope to be back with Version 1 by July – that would market a one-year absence of 31Events – but I’m not putting a timeline on it. So, stay ready, because once we re-launch, it will just work – and you will then be able to send a calendar invitation to anyone, and will just work. Because we are here to change the world of “Add to Calendar”. YOUR webinar is not on THEIR calendar. Seems fairly simple to me, the primarily to get people to register (along with up to three reminders) is based upon email. A one way communication – from you to your customer. No rocket science here. Your email list is gold to your business. It is how you communicate with your customers and prospects. It is a tried and true marketing tactic, and no marketing professional in the world will tell you NOT to focus on email marketing (and I won’t either, it is the perfect communications to announce your webinar). I have looked a hundreds (probably in the thousands) of webinar announcement emails. Every single one will have one and possibly up to three Calls to Action within them. They could be anything from standard text links, to buttons, to graphics – but they all have a CTA. And in 99% of those cases, the CTA takes you to a registration landing page. Once someone clicks on your CTA, they are taken to your landing page. These have become standard and provide additional details about the webinar, who will be presenting, date/time, how to attend, and in more cases than I’d like to see, a very detailed registration form (some habits die hard). Here’s what I’ve noticed, the bigger the company, the more information they want during the registration process. The savviest marketers have realized (a) I already have your name and email address (b) that is how I track you in my CRM/Sales Automation and (c) email and webinars are cheap – the incremental cost for sending one more email or adding one more “seat” to my webinar is almost zero. Which means, most of smaller companies just ask for your basic information – first name, last name and email address – as a way to track against information they already know about you. This is where things can start diverging. Some companies will just say “Thank You” after registration and send an email; others will forward you to a success page, with “how to attend” instructions; others just take your info and do nothing (yes it happens more often than you think). Within that conformation (either email or redirect page), there is usually some way to “Save” the webinar to the calendar. Marketers have never really questioned this activity – believing that if someone has gone through this process, they will actually spend time to “save” their event to their calendar. It is an industry best practice to inundate anyone who registered for your event with several emails, at timed intervals – 7 days before, 3 days before, day of, within an hour of – it varies in frequency depending on the marketing process. These email reminders will either be sent to the whole list (all the people who received the initial email) or will be sent to only those who have registered. If it is the former, there is usually another request (or instructions) on how to save this even to their calendar. Those six steps are are how most webinars are marketed. There may be variations or other tactics used, but if you take notice of the process, you will see this repeated over and over. And you will also notice, most webinar service companies will outline this process as a “best practice” for marketing your webinar. This process, will help you get approximately 10 people to attend for every 1,000 on your mailing list. The problem is – after all that activity, you still don’t know if it’s on their calendar. And if it is on their calendar, what is their intent. Is your event just there, do they have it marked as accepted, declined or tentative. Did the status of that invite change between initial registration and the webinar time itself? You are operating completely blind to their “intent” – you have absolutely no idea. Which is why, you continue to send reminder email after reminder email – because you are under the false belief, that it reminding people helps drive attendance up. Send a calendar invitation on the first Click on your CTA. Follow your tried-and-true process. Keep it alive and well and churning out emails after emails. Just make one of those emails a real, valid, properly formatted, Calendar Invitation. I’m not going to tell you about the benefits of using the calendar as a marketing tool. Because you either already know there is something broken in the process when you’re marketing through time-based events, or you don’t. What I will tell you, is that SAVE or ADD to calendar doesn’t work, it adds multiple steps for your customers and prospects – and we already know, there is a drop-off each time we ask them to do “one more thing” – sometimes it’s just a few people, sometimes it almost all of them. Stop asking them to do that, and just send a calendar invitation. You can do that today, along with being a bit creative with how to interact with those people most likely to attend your webinar. You will either decide to try something new, or continue down the path of tried and true. Hell, if you’ve done more than 10 webinars, you already know your own numbers. Maybe you don’t need more people attending your webinars, or don’t care if anyone puts it on their calendars. For those that believe testing something new is worth a little bit of effort, then just head over to 31Events.com, add your next webinar, add your landing page link, get the “Link Code” for your email service provider, and see what happens. Then let me know, I’m pretty easy to reach, would love to hear what happened. Because my assumption is, it will increase your attendance percentage (it’s help other marketers, including myself). But I could be completely wrong. Is it on the Calendar? The number one excuse for missing anything in business is “it wasn’t on the calendar”. That’s true if it’s an internal meeting of your team or a webinar held for your prospects. The calendar has become an important tool in managing our time, both personally and professionally. It’s on every computer, every phone and included in every productivity application ever created. Companies such as Franklin Covey have made hundreds of millions of dollars helping us manage our calendars. A quick search on Google for the term “productivity calendar planners” will produce over 30 million results. We crave a better way to manage our time, to be more productive, and get better results. And in most cases, we come back to the calendar to help us do just that. My question is, if we know that in managing our own lives, why do we believe anyone else is different? If we manage manage our time through our calendar, isn’t it a logical conclusion to believe our prospects and customers do the same thing? Aren’t their lives just as busy as ours, with dozens of tasks to be completed today, and hundreds during a month? If the answer to that question is ‘yes’, they why not leverage the calendar (which we all know is being used by them) and get our marketing activities right to the calendar. A calendar “event” sent to them is the same as that meeting request you sent to your team this morning. It gets on their calendar, and they can make plans accordingly. We wrote a Ideabook to help start your idea engine. It’s really just a matter of thinking a bit differently about how you communicate and how you ask for someone’s time. We take that very seriously, we don’t believe in calendar spam any more than we believe in email spam. But we do believe, that even if someone has great intentions to attend your “event”, if it’s not on their calendar, there is a higher possibility of them not attending (as evidenced by webinar attendance rates of 40%). So, download the Ideabook, flip through the ideas we’ve presented, and see if one or two might spark a thought on how to improve a marketing activity. Right now, it will only cost a few minutes of your time, but we believe, in the end there are major benefits of using the calendar in our marketing activities. Hello. As we wrap us this year, I would like to introduce you to our Video Log Idea Book that we just completed. A big thanks to Arnie for putting all this content together. We both learned a lot from our customers. At the bottom of this blog is the Video I did. Enjoy! Greg & Arnie. So we have a minimum of 8 touches throughout the sales funnel to establish a customer transaction with a current customer, or even more for a new customer. In addition – we only have 8 seconds to grab a customers attention. 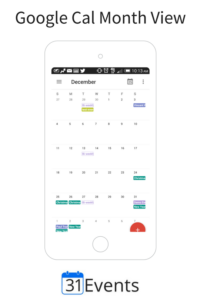 We should be using a Calendar Invitation with the CTA to get to the Mobile phone when possible. 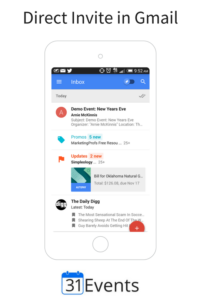 The CTA will not get lost in email and the Calendar invite will use the reminder engine that is built in. Are you using the Calendar to talk to your customers? Likely not. We all use Google Calendar and Microsoft Exchange for day to day dialogs for business. But no one is using a Calendar Server to send Calendar Invitations as a marketing department to communicate to customers. Most are using the Calendar to develop and download and .ICS and put them in the Registration email, or asking them to “Click to Download” the ICS. This does not work well and never will . Did you know that when you send a correctly crafted Calendar invitation that it actually “Splits” and goes directly to your customers calendar? It does. This is the greatest thing for a marketer. 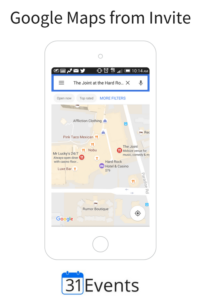 Your offer, with the correct address and call to action with a possible URL for a coupon or an map – can go directly to your customers mobile phone. The Landing page shown here is with our magic Box. The email box is actually the Calendar Invite! Think of it as a replacement for “Add to Calendar”, which never worked well and you could not track. Give it a try. Simple, easy, and effective. Direct to your customers calendar. Customer puts email address in it and they get the Calendar invite on their Mobile Phone. We track track it with our reporting engine. Simple Idea. Insert the PNG, JPG or Gif as a URL into the Calendar invitation as the CTA. Get the correct physical address into the Calendar invite. Let the customer put in their email address. They receive a Calendar invite directly to their phone. We track it. You could do this on Your Web site , or integrate into your email campaign with out CTA script. It does not get lost, and they can retire the coupon at the correct CTA time, since it popped up on their phone with the reminder. So multi-event listings or pseudo schedules seem easy but they are hard to make simple. In this picture Arnie, my marketing friend here @31events put together this diagram to show how we can assemble 3 different calendar invitations with our easy to use “magic box”. Think of this as a “Add to Calendar Replacement”. Or Add to Calendar on some Big Mega Steroids. Customer see’s 3 different time slots. They pick one or more. They receive a calendar invite directly to the mobile phone with a BOOTH MAP as a PNG stuffed into a URL. Your customer get a chance to come by your booth because they have a Booth # , Map and a CTA to come buy and get a Free tShirt or a Personal One on One demo. Think about how many times you have asked your sales team – hey send out come emails and tell your customers to come by the BOOTH. Well now you can develop that offer and get the Calendar invitation right to the customer’s phone! 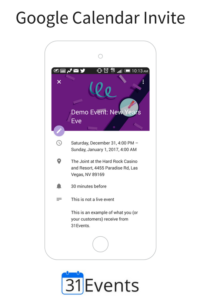 You can send the code out to your sales team and they can put the invite right into their Vcard, to help you help your customers get to your booth. We all use the Count Down Clocks. Think about combining them with us. We actually have one running in combination as an integrated Modal with the Countdown Clock at the top and the Calendar invite embedded in a Popup Modal for a website with a built in coupon. This diagram shows how it could be used on a WebSite. But there are many more. Give us some feedback on how you would use them. The first one that does give us feedback gets a $25 Amazon Card! Just contact us on the Disqus thread or Tweet us directly @31events. So in this diagram we are advocating you try using our embed script for CTA in your Email Marketing program. We can send a calendar invite when the customer clicks the Call to action button in the Email Template. Its simple and we track it. The great part is that we don’t require you do anything different. Just give us a test run in your email campaign testing. We believe you are going to see better results. Well believe it or not was our original invention. We built a calendaring web service to send direct invitations to our customer base. Since they knew us, they responded better and they just accepted it onto the calendar for the event. If they they were not sure, the event was still on their calendar in a grayed out position. When the event came closer – sometimes they accepted , or sometimes they denied it. But we were communicating with them – all through the calendar. Early on – PRIOR to the mobile phone it was working well. 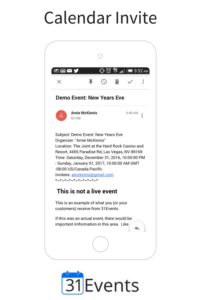 Over the past 10 years it is working well since all people have their phones and have a calendar on them – and the events do not get lost in email. 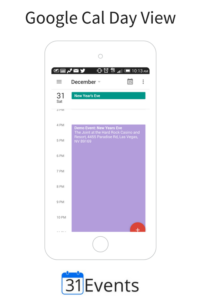 Uses cases include OPT in lists of customers that prefer direct calendar invites. Another big idea is SUBSCRIPTION customers that order on a regular basis, where by sending calendar invites with information and offers would be welcomed for extra discounts in CTA or coupons in the calendar. The ideas are endless! Thanks for listening to the first 7 Ideas from Arnie and Greg @ 31events. Here to the next 100! Again if you have ideas on how to use them or want to do some GUEST BLOGGING with us. Please reach out @31events on Twitter or within the DisQus Thread. Get the Ideabook, just click the button the button below for the PDF version. Let me see a raise of hands, how many of you …. 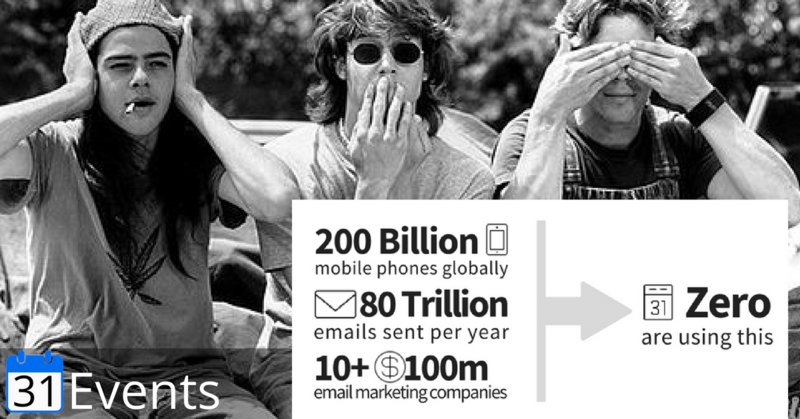 Like 8 trillion emails a year huge. Like 200B mobile phones huge. Like multi-hundred-millions-in revenue for companies such Mailchimp, ConstantContact, SendGrid huge. Now, let me ask you another question – and please show those hands again – how many of you have gone to the effort of crafting DRIP campaigns? (and if you don’t know what a drip campaign is, then you don’t really do them, so please take down your hand). Drip email campaigns are crafted, the are (were) born from a requirement to create “touches”, which is the holy grail of marketing and demand generation. We (as marketers) are forced to think how to create demand from the 8 or less seconds we have with any single consumer of our product. That bull rider and you have the same problem – stay on the beast for 8 seconds or lose. At least when we lose, no bones are broken, but careers are built on that 8 seconds – yours, mine, and that brilliant 13 year old trying to become a Youtube sensation. One Event is all your customers can think about at a time. Which means that ONE event is the key to success. And since your customers are like every other customer out there in the world, you have 8 seconds and ONE CLICK to get it right. I would guess, almost 100% are wasting that one click sending one more email (or a series of emails) or spamming their calendar with 100s of events (not the one they are interested in). And you still don’t know if they have it on their calendar!! Here’s the difference … 31Events is all about getting that ONE Event, on your customer’s calendar, in ONE click. And once it’s there, you can talk to them based upon that single action. If they accepted, you can reward them. If they declined, you can ask why. If it’s just sitting there doing nothing, ask them to do something, and provide an incentive to do it. What you can’t do, once you have that information, is ignore it. But, while you’re stuck in the world of Email Marketing, worried about open rates and click through rates and all the other interesting little data points of email, you will start losing market share to someone else, that came out of nowhere, that is actually getting their marketing campaigns on someone’s calendar, and talking to them like human beings, instead of screaming at them through mass emailing bullhorns from your prominently positioned soapbox – because you have no clue about their intent with your event. That’s the punch line – I’d love to chat more about it. We have spent years, perfecting a solution that jumps beyond the “manufactured” touches of email, and starts marketing to the only real non-renewable resource, TIME. Note 2018 Update – This was an orginal post of of our 1st version of software that is no longer available. I thought I would leave the post as a reminder and a small Easter egg for Arnie and I on some of the first requirements. As we continue to build and experiment with Calendar Modals for the Mobile phone, we stumble upon some good mockups around trying to get responsive design to work across desktop and mobile. In this case we believe this one is going to work well. We have standardized on BANNER, CALENDAR INFO, INVITE EMAIL BOX, CALENDAR MESSAGE, COUPON, SHOW MORE , SHOW LESS as a standardized Template for our script generator. We have over 20 modals running today for Web Iframe Embed. Simple. Your Event, Their Calendar, One Click. WP Plugin – Elementor: I personally can’t say enough about Elementor, it is pure drag-n-drop and simple to use. GET YOUR EVENTS ON THEIR CALENDAR, IN ONE CLICK! 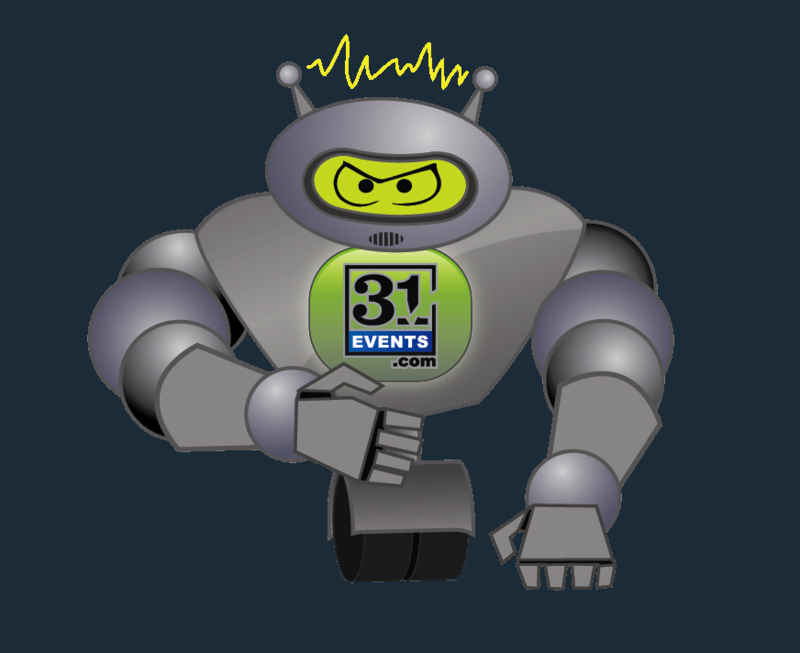 31Events is focused on getting your events on your customer's calendar with one click. 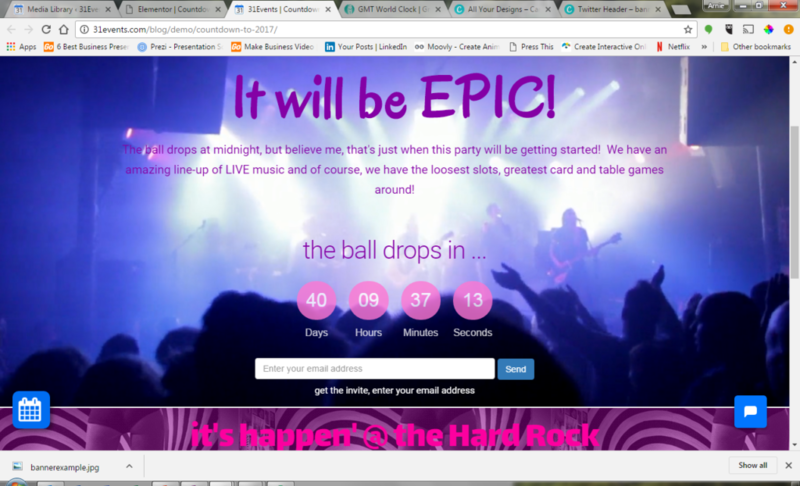 Create your event, send an email or embed into your website. Your customer only needs to enter their email address and an invitation is on the way.